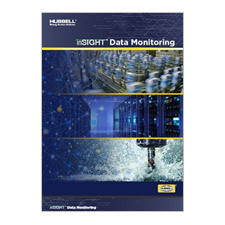 Shelton, Conn. – Feb. 1, 2019 – Hubbell Wiring Device-Kellems’ new line of inSIGHT™ Data Monitoring solutions is designed to help industrial manufacturers and data center owners use information and analytics to better predict and prevent costly downtime before it happens. For analytics purposes, inSIGHT™ Data Monitoring devices provide data directly at the point of use – including current, voltage, power, and internal temperature – while helping predict potential process deviations. Pin and Sleeve Devices: Data monitoring is incorporated into standard IEC packaging. Internal temperature is measured directly at the termination. The system is easy to set up and self-configure, as devices automatically pair up to the closest gateway once powered up. Ethernet Gateways: The gateways gather data from all monitoring devices and transfer it to a front-end dashboard for visual and historical analysis. The gateways also allow the system to send immediate notifications when data falls outside of the designated parameters. Each gateway accepts up to 150 monitoring devices at a maximum distance of 30 meters from node to node. Smart Power Cables: These cables provide quick plug-and-play monitoring directly at the point of use. To connect, users simply disconnect the existing connection point and then plug the monitor assembly inline to the power feed. A pre-wired monitor transmits power usage to a central gateway. Circuit and Environmental Monitors: These devices monitor single- and three-phase circuits in pre-configured enclosure kits to offer insight into power consumption, load balancing, cost allocation, and historical trends. Software: Cloud-based or local software packages are available if BMS or DCIM software systems aren’t currently being used. For more information about the inSIGHT™ Data Monitoring line, contact your Hubbell sales representative or visit www.hubbell.com/wiringdevice-kellems/en. Hubbell Wiring Device-Kellems is a division of Hubbell Incorporated, an international manufacturer of quality electrical and electronic products for a broad range of non-residential and residential construction, industrial and utility applications. Hubbell Wiring Device-Kellems offers a wide array of electrical and electronic wiring devices, wire management systems, occupancy sensors, lighting controls and specialized wiring products for the marine and healthcare markets.